The name of the Vinnie Bass is derived from „vintage“ and hints to the sound it produces at the same time. 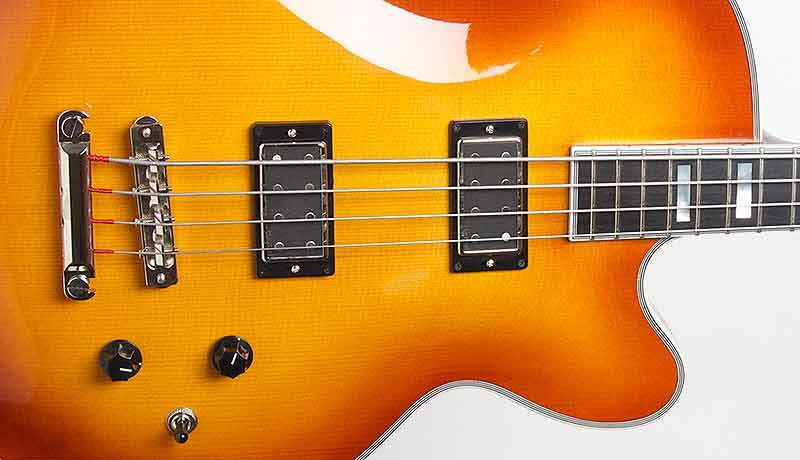 The body of the Vinnie Bass is made like the Weltklang guitar. Constructed of sides, solid maple back and solid spruce top and a sustain block underneath pickups and bridge makes it a semiacoustic model. This construction provides a very dry sound with growling mids which reminds a lot of the vintage sound of the 60s. But contrary to that sound the solid woods give the Vinnie Bass much better dynamics, response and sustain and a wide range of frequencies. These features make it very suitable also for modern playing techniques and stiles. 4.500	€ incl. 19 % VAT, Pickupe finish in natural color. A choice of other colors is available at an extra cost of 500	€.